I grew up in a house that didn’t go for excess. Rather, we were proud of our thriftiness and resourcefulness. Okay, that’s a lie. When I said “we”, I meant “my parents” – because I wasn’t totally down with my parents miserly ways. Our meals didn’t come with rich sauces and desserts weren’t the norm. We also didn’t over do it with the cheese. As a kid, I’d escape with money in my pockets and stockpile sour candies from the corner store. If there were opportunities for junk food binges, i participated wholeheartedly. But now as an adult, I can appreciate some of those lessons from my childhood. While I still find it hard to have restraint with an open bag of chips, I’m on board with not over doing it with cheese. Take this mac and cheese recipe which calls for 4 cups of cheese. That’s a whole pound worth. Calories are needed and delicious but I don’t want all the calories in my dinner, so I cut the amount of cheese in half. Be thankful that I didn’t title my post: I Cut The Cheese because I can be immature like that. However, reducing nearly 2 cups worth didn’t ruin this mac and cheese. Maybe because I used an extra strong white Cheddar I didn’t lose any of the flavour. It was still rich, creamy and deliciously cheesy. But if you want to go for that cheese-laden crust (go ahead, gasp at that NYT photo), then go for the full pounder. What’s also interesting about this recipe is that everything from the cheese to the milk to the uncooked pasta gets mixed up in a bowl, dumped into a baking dish and baked. No need for the extra steps of cooking the pasta and making a sauce. It’s pretty much foolproof. Make sure to serve this rich dish with a green vegetable or two. Even without all that cheese, I like to feel a bit more virtuous. See? Those childhood lessons on austerity live on! Preheat the oven to 375F. You probably should butter up your baking dish. I did not and everything turned out fine (well, nothing that a little pan soaking in hot soapy water couldn’t solve). Blend together the cottage cheese, milk, mustard, nutmeg, salt and pepper in a blender or food processor. In a blender or food processor, puree cottage cheese, milk, mustard, nutmeg, salt and pepper. 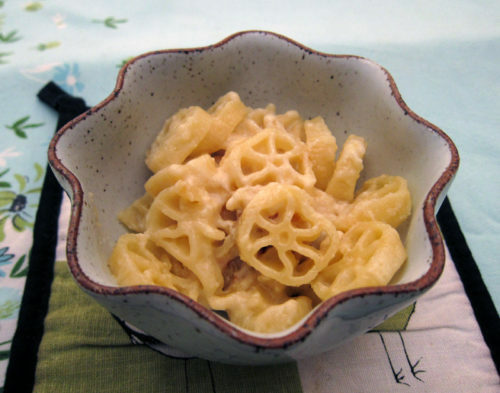 In a large bowl, combine the milk mixture with the uncooked pasta and grated cheese (reserve 1/4 cup for the topping). Pour everything into your baking dish and cover with a lid or foil. Bake for 40 minutes, give the mixture a stir, dot with butter, and sprinkle with the remaining cheese. Bake uncovered for another 30 minutes or until the pasta is tender and the cheese on top is golden and crusty. Let stand 15 minutes before serving. Serves 8. Yum! 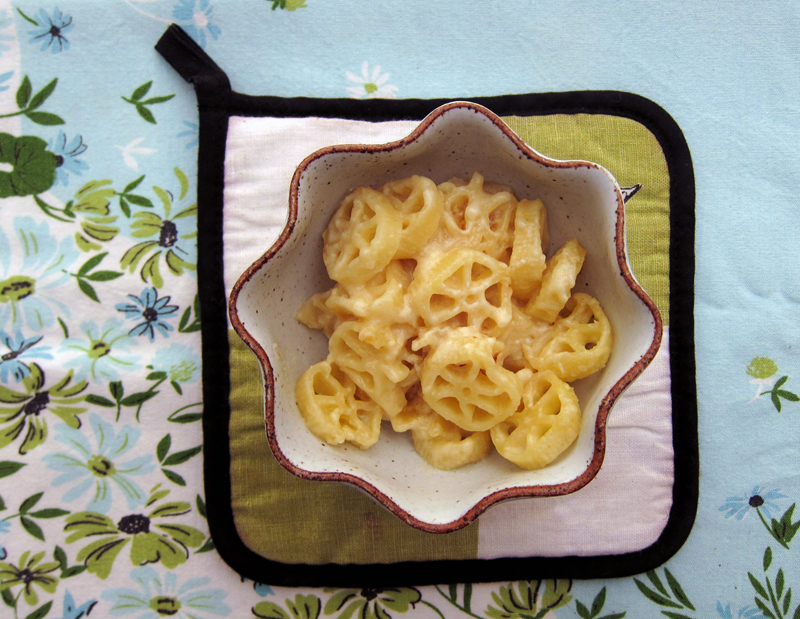 Your version looks a LOT like the low fat mac & cheese recipe from Moosewood Restaurant Low-Fat Favorites, except that it skips the butter and uses low-fat buttermilk instead of whole milk, plus a dash of cayenne pepper. It’s AWESOME! I am in love with this one pot recipe! I love mac and cheese, but when I’m in a rush to get something into the oven (and into my belly), I don’t want to bother with cooking the pasta, making the sauce, etc. Definitely going to give this a try soon! This reminds me of a similar dish I used to make for my children when they were small. It’s a comfort-food keeper. And, as usual, the photos are superb. I just made a make mac and cheese last night with a bechamel sauce and just enough cheese to make it taste cheesey. A sharp cheddar is good for that. I’m Australian and I find the amount of cheese in the average American mac and cheese recipe absolutely astounding. I just can’t come at putting that much cheese in. I’ll give this one a try though. I’ve never made mac and cheese without cooking the macaroni first. Hmmm… I wonder if this would work with gluten-free rice pasta? Time to test it! You’ve captured my feelings exactly on mac and cheese.. if you’re gonna make it, it might as well be rich and delicious, but I don’t want to go overboard. One thing I love (though purists might scoff..) is to add veggies right into the cooking pasta to be baked in and coated with the saucy deliciousness. Last time I did this, I used diced cauliflower, broccoli, and a handful of frozen peas, thrown into the pasta pot while the pasta’s in its last minute or so of cooking. I’m loving this easy way of mac&cheese… The thing is in my family we NEVER had mac&cheese, we always had macaroni with tomato sauce and then cheese. Now I’m obsessed with all this cheesy goodness. 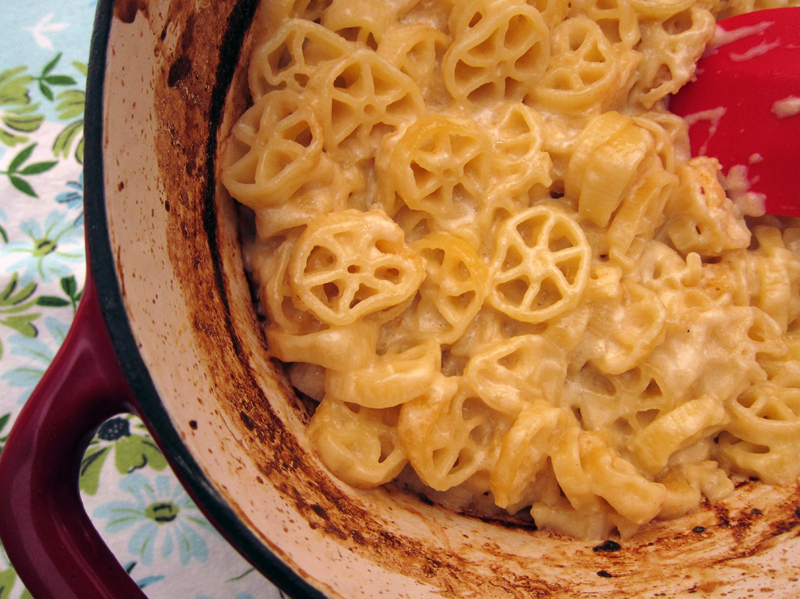 This looks like the PERFECT mac and cheese – made fun with wagon wheels! Most mac and cheese recipes turn me off with what seems like a ridiculous amount of cheese. I’m trying this recipe for lunch this week… Thanks! This looks delicious!! Even without a pound of cheese 🙂 Crazy! Joanne, I usually do make mac & cheese with veggies (i’ve got a recipe in my archives for a kale & cheese sauce version and it’s amazing too). Hope you give it a try, Amanda! I totally know what you mean, Elizabeth. I always reduce the amount of cheese in most mac & cheese recipes. A good strong cheddar or other flavourful cheese will add the flavour! Faith, I have no idea, but I can’t see why not! Let me know if you give it a try. Elena, I do that too usually! I’ve added cauliflower, broccoli and kale in various recipes. Thoughts on making inthe Crock Pot? Tanya, I think it should be okay after consulting a few other mac & cheese recipes online that also use uncooked noodles. Let me know how it goes! Made it in the crock. I added a half head of cauliflower, chopped, and 1 1/2 cups frozen peas. I didn’t have any cottage cheese, so subbed 2 Tbsp ground flax + 1/4 cup water, used 3 cups milk. Cooked on high for 4 hours in a 4 quart crock pot. Turned out really good. I like your alternative title “I cut the cheese.” Thanks for the laugh! Tanya, so glad it worked out in the crock pot!! Thanks for sharing. Hahaha thanks Gretchen, I really am a 12 year old boy! I LOVE mac and cheese but never make it b/c of the huge amounts of cheese…love how you reduced it..will definitely give this a try! Thx for sharing! Hi there, this looks so yummy! I’m thinking of trying it with ABC pasta for my daughter’s Bday party- do you think it would need to cook as long with smaller pasta? Thanks in advance! Amy, I think you could bake it a little less – let me know how it goes.